To avoid bisphenol A, or BPA, a hormone-disrupting chemical, found in metal canned foods, buy Eden Organics brand (the company uses cans without BPA in their liners), look for frozen beans, or buy dried ones and cook them accordingly. Almonds, walnuts, pecans, pistachios, cashews, and pine nuts are all good vegetarian protein sources. "Try a sprinkle of chopped nuts on everything from oatmeal to yogurt to salad, and nut-based dressings are healthy and delicious," says Blatner. On the seed side, Blatner recommends pumpkin, sesame, and sunflower. "I particularly like seed butter, such as sunflower seed butter, on toast with an apple for breakfast," she says. Though the protein content isn't as high as some other vegetarian foods out there, chia seeds pack a huge nutritional punch. For starters, they're an incredible fiber resource with nearly half (11 g) of the amount you need every day in a single ounce. That helps fill you up and eat fewer calories. They also contain 18 percent of your daily calcium requirement, more than triple that of milk, which helps your bones. Chia seeds have no flavor, so you can add a tablespoon to any food you wish to without altering its flavor, and unlike flax, chia seeds don't need to be ground in order for your body to absorb all the nutrients. How Common is Genetically Altered Food? "I call tofu the veggie white meat, anything chicken can do, tofu can do, too," says Blatner. "Tempeh [a fermented form of tofu] has a fabulous texture and is a great burger stand-in or perfect crumbled in chili or seasoned or broiled into a high-protein crouton on a salad." Look for organic products to avoid genetically modified soy and hexane, a cancer-causing contaminant that has been detected in heavily processed, nonorganic soy products. If you're not a fan of tofu or tempeh, you can still reap the protein benefits of soy in soy milk (8 g per glass) and edamame (green soybeans, which have 17 g per cup). But do go easy on soy products, as too much can raise estrogen levels and wreak hormonal havoc in both women and men. Aim for one serving of tofu, soy milk or edamame per day. If you're allergic to soy, or just freaked out by its estrogenic activity, hemp products are your next best bet. Sold as a dairy alternative or as seeds, hemp is one of very few plant proteins that supply you with all the essential amino acids, acids your body can't produce on its own to build muscle and create more protein. The fatty acids in hemp seeds and hemp milk also boost your immune system, and the crop itself is highly sustainable, growing as fast as 10 feet in 100 days and naturally requiring very few pesticides. There's a reason the incredible, edible egg is such a popular breakfast choice. The protein in eggs has the highest biological value, a measure of how well it supports your body's protein needs, of any food, including beef. And the yolks contain vitamin B12, deficiencies of which are common in vegetarian diets and can cause attention, mood, and thinking problems while raising blood homocysteine levels, a risk factor for heart disease, dementia, and Alzheimer's. All dairy products are good sources of protein. A glass of milk provides you with 8 g, but Greek yogurt is a protein powerhouse, with twice the protein and half the sugar and carbs of regular yogurt. In fact, Greek yogurt contains the same protein as a three-ounce serving of lean meat. Top that with a handful of nuts and you could get half of your daily protein intake at breakfast. 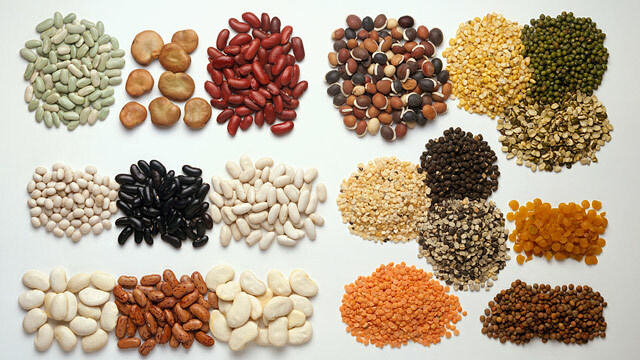 Mixing different vegetarian protein sources into your daily routine also insures that you're getting the right mixture of amino acids, which aid in building muscle and regulating your metabolism. All vegetables contain between 1 and 2 g of protein per cup, but avocados (which are technically fruits) surpass them all. Though 4 g may not sound like much, avocado protein contains all nine essential amino acids, the amino acids your body can't produce on its own to build muscle and create more protein, in addition to heart- and brain-healthy omega-3 fatty acids. There may even be a reason these fruits are in season during flu season. "Protein not only builds muscle and maintains organ structures, but is also needed to mount prompt, strong immune responses," explains Carol S. Johnston, professor and director of the nutrition program at Arizona State University's College of Nursing and Health Innovation. "You want to have adequate protein intake daily to have amino acids ready for immune protein synthesis at the time of infection." There are grains, and then there are pseudograins. Grains, wheat, barley, rye, brown rice and corn, all contain decent amounts of protein, and globally, wheat provides more plant-based protein than any other food. But intolerance to the gluten in wheat, barley, and rye is on the rise, owing to the increased use of these grains in processed foods. So if you want to go gluten free, look to corn, rice, and pseudograins, foods that are cooked and served like grains but are technically seeds, including quinoa, amaranth, buckwheat, millet, and wild rice. If you stick with corn, replace the standard yellow or white corn products with blue corn, which has 30 percent more protein. OK, so beef isn't vegetarian, but you don't have to give up meat entirely to get heart-, brain-, and planet-friendly protein. The UN report finding that factory-farming was so bad for the planet also noted that improving animal diets and getting them off of grain was one huge step meat producers could take to counteract global warming. In other words, feeding animals their natural diet of grass and forage is better for our climate than pumping cattle full of corn and soy, which increase "enteric fermentation," or, basically, flatulent cattle that produce methane, a potent greenhouse gas. That diet also produces healthier beef. Grass-fed meats routinely show higher levels of omega-3 fatty acids and other vitamins, as well as lower levels of E. coli, than factory-farmed beef. Shop for grass-fed beef at your local farmer's market, or order it online through U.S. Wellness Meats.